I obviously love to bake. I'm pretty steadily mastering the art of making delicious-tasting desserts, but have been incredibly slow on the uptake with paying proper attention to delicious-looking food as well. 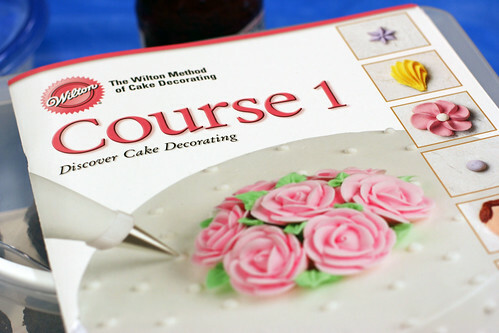 On a whim, I signed up for the Wilton Cake Decorating Class last month. 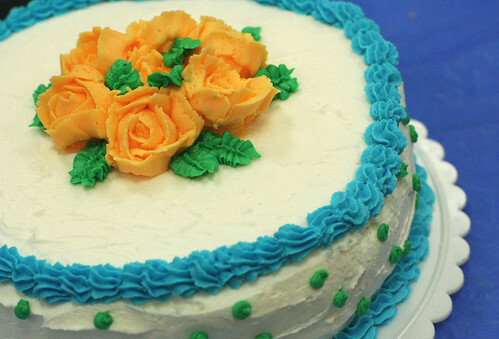 The Wilton curriculum is a series of 4 4-week courses, and I just completed the first, called Discover Cake Decorating. It's held at my local Michael's craft store, and I leave there every Monday night covered in frosting, hand aching, and smiling ear-to-ear. These classes are held throughout the U.S. and internationally, so I thought I'd give a little rundown of my thoughts in case you're interested in signing up. Overall, I loved the class, and have actually already started Course 2, Flowers and Borders. Our instructor, Carolyn, has been fabulous, and she's especially great at not making me feel lame when I'm doing something ridiculous (couplers and I don't really get along), which seems to happen quite often. 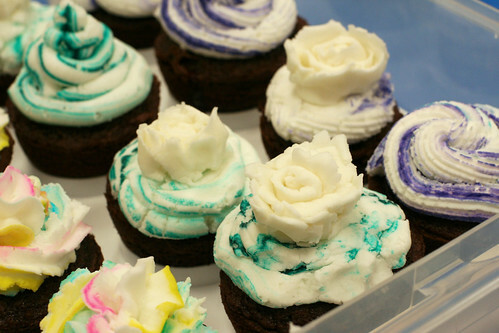 My only real issue with the class is the frosting they have us practice with. The main ingredient is vegetable shortening, which makes the frosting incredibly messy and greasy, and I strongly prefer not to eat it. There's a saving grace there, because I don't like it at all, I don't snack while I'm practicing, which my body thanks me for. I also find it difficult to work with, though, even at the different consistencies they teach us how to make. I'm a chronic rule-follower, so I continued to make it and bring it to class instead of trying a different recipe, knowing that I'd have freedom outside of class to practice with more delicious frosting. Other than that, I loved everything about the class, and it's been making my Mondays a lot more bearable. I still have a lot to learn, but that's what makes it fun. Week 1, Lecture: No hands-on, just a demonstration and lots of fun shopping! I bought the biggest kit they sell because I know I'll use it forever, but you're free to pick and choose which supplies you buy. Week 2: Rainbow cake! Not to be confused with my original masterpiece rainbow cake. I made this the week of my birthday. 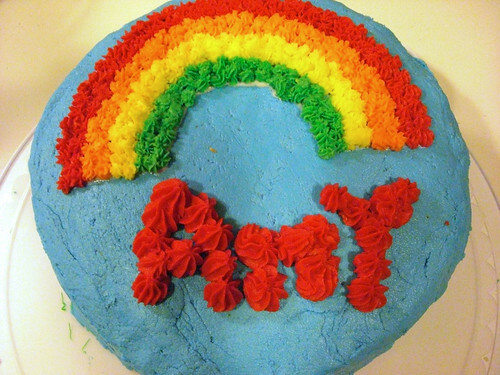 There was a picture in the textbook for that week that showed how to make a cake that says "Happy Birthday Amy." Not even kidding. Week 3: Cupcakes and Roses. I decided to make a mess with color too. Obviously. Week 4, Finale: Carolyn let us do whatever we wanted, but I stuck pretty close to the textbook cake (see Week 1 photo above), since it used techniques I wanted to practice more. The inside was 2 layers of red velvet filled with left over coconut-pecan frosting from my German Chocolate Cupcakes. *Reminder* Leave a comment on this post by Friday, January 8th for a chance to win a copy of the classic cookbook The Joy of Cooking! Hun, now I want to take a cake decorating course. As soon as possible, please (okay, I'll wait until exams are finished). Yes, there is the gf issue, but do you bring your own cake? Lauren~ yes, you bring your own cake. I think you'll love it! Carolyn is a great teacher I know this because we are fellow instructors , even though I live across the country in upstate New York . She has always been there to help me out! I am so glad that you had a great time you did an awesome job ! I highly recommend check out the other classes offered you will have a great time and learn so much ! I really want to take that course. I've been trying to figure out when I can fit it into my already too busy schedule. Your roses look beautiful - I'd love to learn how to make those! I have always wanted to take a Wilton cake decorating class, but oddly enough, I do not believe they offer them anywhere in NYC. 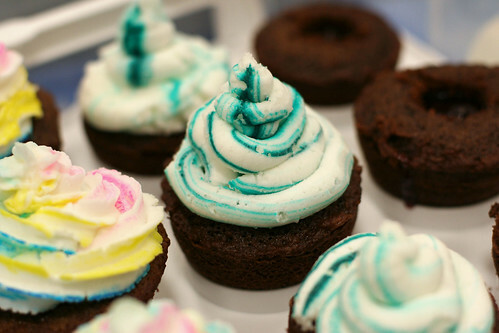 Your cakes look awesome!! You should be very proud of yourself!!! What a fun idea! I'm not terribly interested in the baking side of things, but I think I could get behind the decorating! I've heard wonderful things about these classes from other people so I'm glad to see the reputation is still in tact :) Great job! Wow, you did a great job! I love your roses! I did cake decorating professionally for awhile - and I never made the nasty frosting that is recommended in the Wilton books. 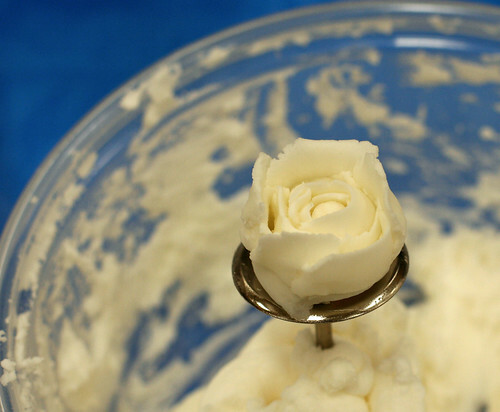 When I make cakes for myself I use a butter cream recipe with exclusively butter. When I make cakes for a job I used half butter and half shortening. It doesn't taste quite as amazing, but it's still really good and it holds up alot better than the pure butter frosting. Thanks for posting a review. I actually started the class last week and couldn't find a single review online. I just happened to be browsing blogs, and there you were! I just started this course - my second class is tomorrow. The first week we practiced on cookies - tomorrow is a real cake. 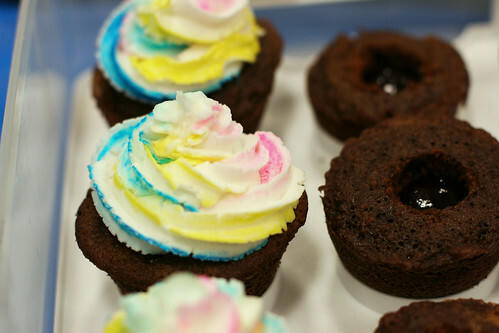 I have to bake one today! I just bought the student kit, but I think I will end up buying the "big boy" too. I really want to take that decorating course. I've been trying to figure out when I can fit it into my already too busy schedule. Your roses look beautiful - I'd love to learn how to make those! Some really nice stuff on this internet site , I enjoy it.